Miranda and Rosie are here to help give you the inside track. 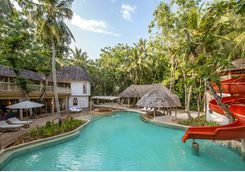 Spend a week falling in love with the idyllic Maldives and the fantastic Soneva Fushi, taking advantage of all the fun filled family activities. 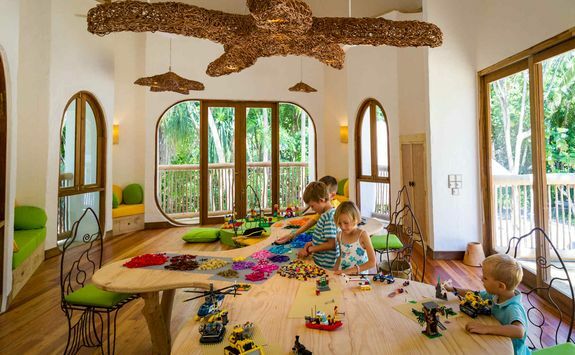 Let the kids run riot in Soneva Fushi's famous 'The Den' kids club - it really is as good as you've heard! 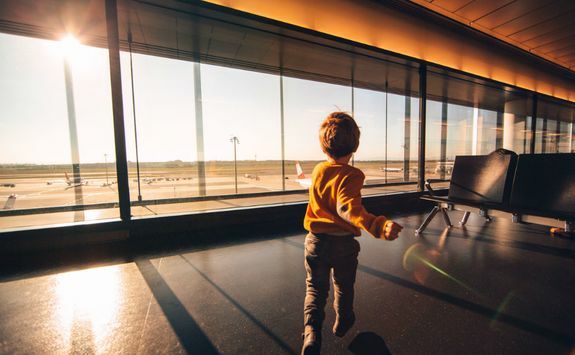 Head to the airport this afternoon to begin your family holiday to the Maldives, the children armed with their personalised Sharky & George fun packs full of games and quizzes. After checking in there should be enough time for a quick game of eye spy or an 'Airport Olympics' before you board the plane for the direct ten-hour flight to Male. 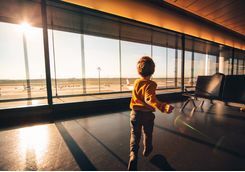 Landing onto Maldivian soil early this morning means you'll enjoy fantastic views of the islands as you come into land so get the little ones excited by pointing their gazes out of the windows. Once you've cleared customs you'll then find one of our team ready and waiting for you with a board bearing your names. 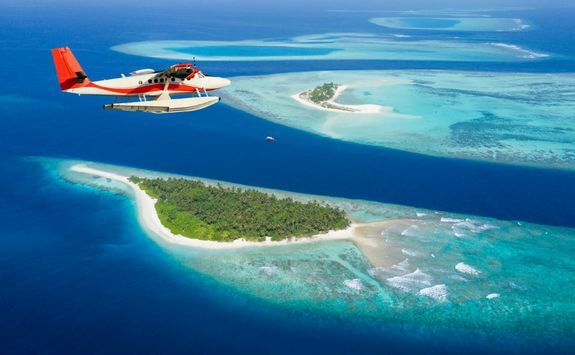 From here you will be escorted to a seaplane to make the final leg of your journey directly onto the island of Kunfunadhoo in the Baa Atoll. Again the views from the air are simply stunning so make sure the children have window seats. 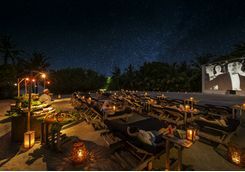 Disembark at your final destination, the beautiful and much celebrated Soneva Fushi private island resort, where you'll be greeted and checked into your luxurious island accommodation. 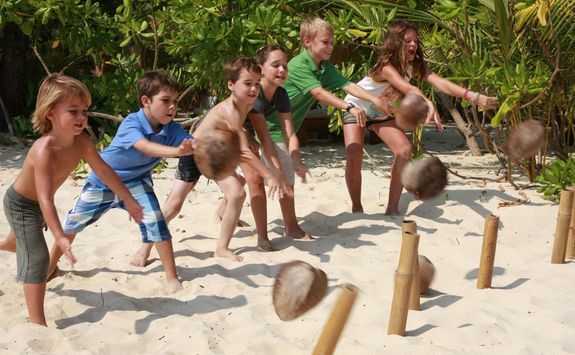 Spend the rest of the day exploring the resort and letting the kids run free on the white sandy beach before dinner. Whether you already have a brood of water babies or yours are a little unsure, by the end of this holiday we're sure you won't be able to get them out of the sea. 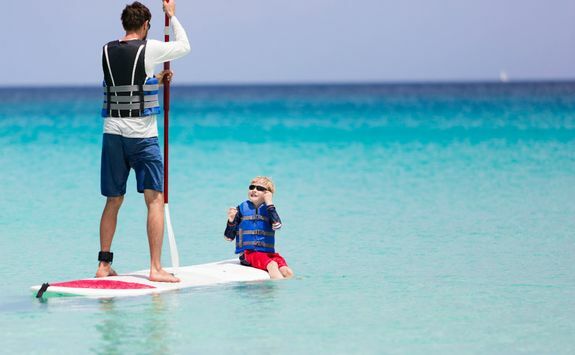 Begin their aquatic education today with a day spent on the beach enjoying the numerous complimentary water sports activities on offer. 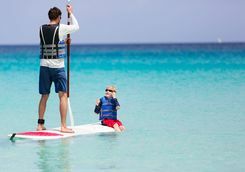 From kayaking around the island to practising your paddle boarding skills and learning to windsurf there are numerous options that both kids and adults will love. And in between seafaring you might just find some time to build a good old-fashioned sandcastle too. 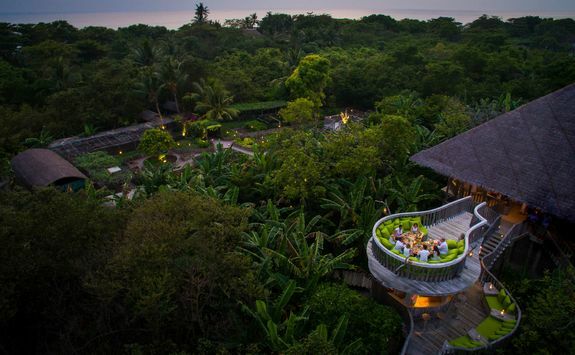 As night falls, tuck into a delicious dinner at Fresh In The Garden restaurant and then head over to Cinema Paradiso for a private screening of one of your family favourites under the stars. Fear not, no screening would be complete without popcorn and ice cream aplenty so you should have some very happy children on your hands. After a busy day of swimming and exploring yesterday spend today in sweet idyll, doing very little except taking in your beautiful beach surroundings. Though that might sound like heaven to any Mum's and Dad's reading this we do understand that the younger members of the family will more than likely be horrified at the thought of doing nothing all day. 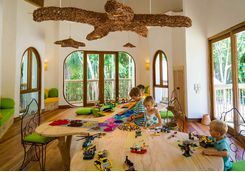 Luckily Soneva Fushi's The Den (don't you dare call it a kids club) is open all day and offers a huge range of activities such as swimming, sliding, dressing-up, play-fighting like pirates on a custom built pirate ship, getting crafty and a Lego room. So, drop the kids off, hit the beach and enjoy some peace and quiet as you get stuck into your books. By the time you go and collect them, we image they'll have enough stories to keep you entertained throughout dinner. 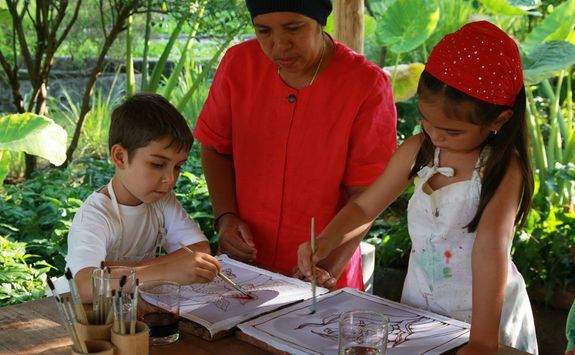 After a day of adjusting to your new tropical surroundings and basking in the resorts luxury facilities yesterday, introduce the family to a more authentic side of island life today. Take a boat over to Eydhafushi Island which is the capital of the Baa Atoll and then meet the local residents as you are introduced to their homes, school, mosque and shops with your local guide. 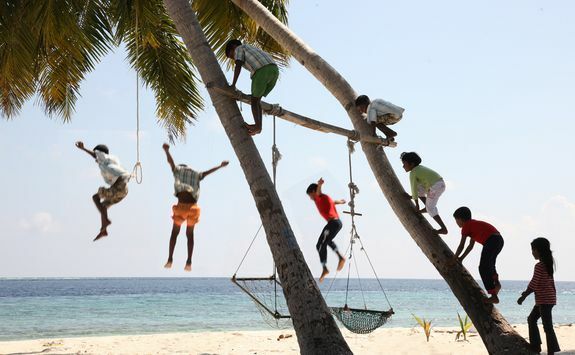 Let your children interact and play with the local children and enjoy watching how well they get on. 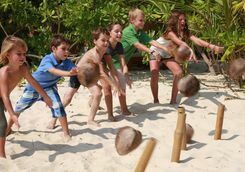 This is a really eye opening experience for adults and children alike and provides chance to see how island life carries on away from the luxurious resorts the Maldives is so famous for. Head back to the resort for lunch and the afternoon is then yours to spend as you please. 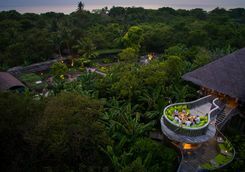 Whether that's in the sea, on the sand or spotting tropical flora and fauna in the gardens and rainforest. 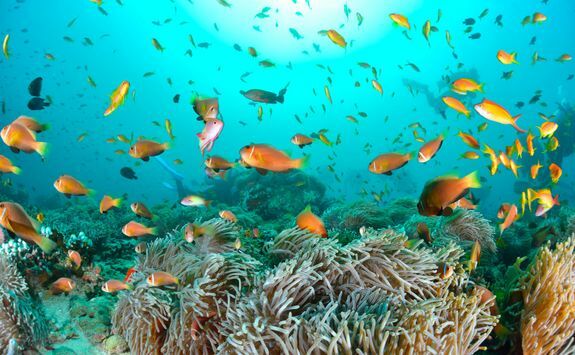 Everyone's favourite fish, Nemo the clown fish can be found in huge numbers in the reefs around Soneva Fushi. 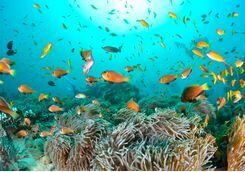 Today head out on your own mission to find Nemo - along with a whole hoard of other cool and colourful marine life - as a family. Start the day with a hearty breakfast to prepare you for a morning of swimming, then meet the resident marine biologist for a guided snorkelling excursion. As you explore the reef have your Go-Pro's at the ready and regularly come up for air and a titbit of new knowledge from the biologist. With turtles, manta rays and octopus all calling the reefs here home you should have some seriously cool sightings. When you start to tire, stop and meet the boat to head to a deserted island for a picnic on the beach. Discuss your favourite spotting and look over your fish selfies before you go back to the resort for the rest of the afternoon. 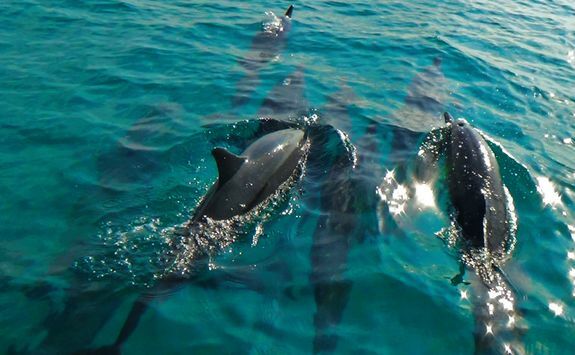 If you are already a big swimming family or Mum and Dad like to dive and want to introduce the little ones, Soneva Fushi offers amazing beginner diving opportunities. 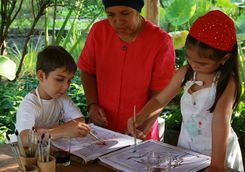 The Bubblemaker programme is specially designed for youngsters and caters for them from eight up and as there's no pool the action takes place on the house reef. 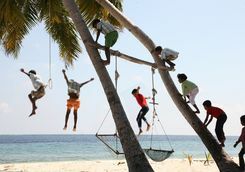 As a resort with eco principles at its heart Soneva Fushi takes its commitment to recycling very seriously. So seriously in fact that it has come up with an ingenious way to re-use the discarded glass bottles on the island in an 'upcycling' programme. 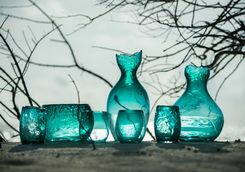 This morning get out of the sun for a few hours and visit The Glass Studio, where you'll be given a fun and interactive glass blowing lesson. After watching the specialists at work and letting the children lend their hands, you'll leave with a selection of homemade and (hopefully!) 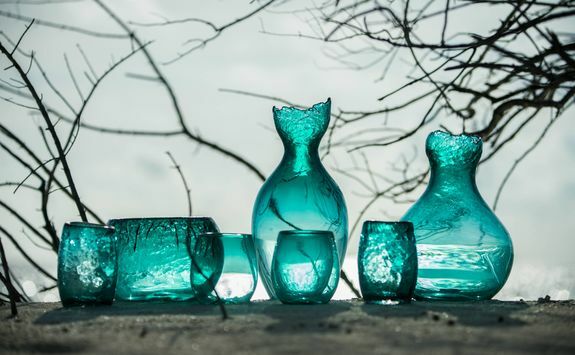 beautiful glass pieces to remember your stay by. After lunch, head back to the beach or the pool for an afternoon of splashing and sun. 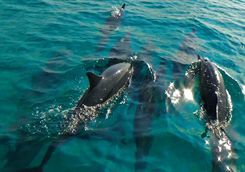 Then, as the light starts to fade, meet the resort boat and head out to sea for a sunset dolphin spotting cruise, something we think will excite Mum and Dad just as much as the children. There really is nothing quite like seeing dolphins jumping and playing just metres from you as the sky glows pink and orange above. One of the best things I have ever done for sure! 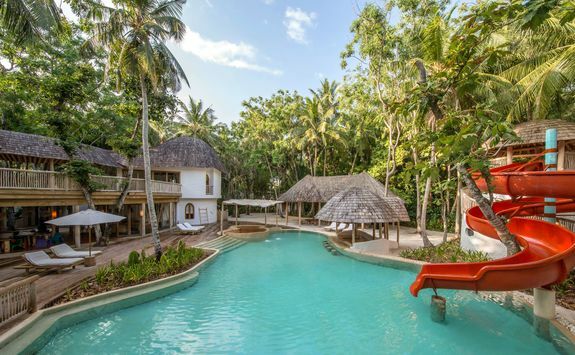 You might have been based on a private island in the midst of the beautiful Maldives archipelago but you've certainly been kept busy over the last week. So, for your last day we've factored in some time for a little bit of good old fashioned R&R. Of course, the kids will probably be desperate to head straight to The Den, leaving Mum and Dad free to spend a little bit of quality time together in the sunshine - win, win! 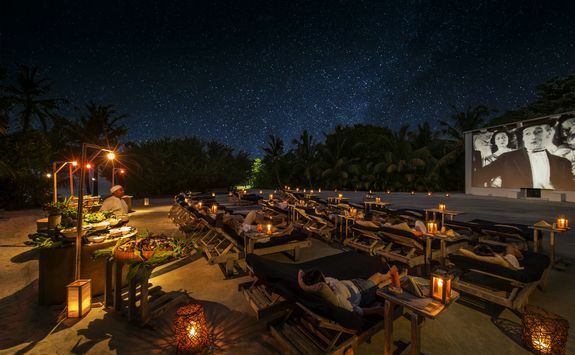 After night falls and you've all re-grouped for dinner, top off a magical trip with a spot of stargazing. 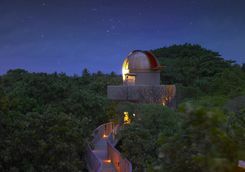 Alongside a private guide you'll spend an hour in the dedicated observatory using the state-of-the-art telescope to find fantastical constellations and far away galaxies that can be seen in this unpolluted part of the world. Pick up some astronomy skills and wonder at the other worlds up there, before going to bed with heads full of starry skies. Treat yourselves to a spa treatment while the kids are busy in The Den. 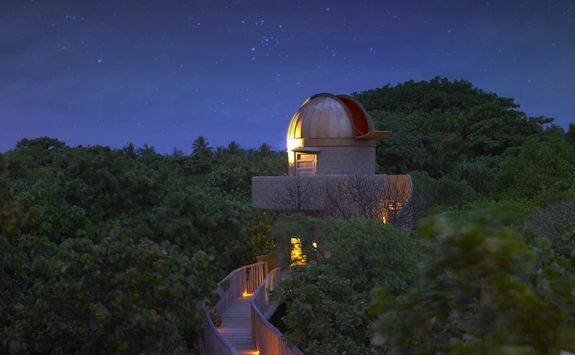 Sadly the time has come to say goodbye to the beautiful Soneva Fushi. 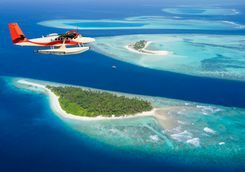 Swap your sandals for shoes and board the seaplane back to Male airport in time for your direct international daytime flight home. As with on the way, the journey is around ten hours. Miranda and Rosie are our experts for this itinerary and as seasoned travellers they have the inside track on the most memorable adventures.